–Edward Bolme, "Heart of the Garden"
At 2017’s Kiku Matsuri, the newly crowned Hatamotos of Legend of the Five Rings: The Card Game convened to make an important decision: should the Unicorn’s perplexing Meishōdō magic be censured throughout Rokugan, or should the clan be forced to reveal their secrets to the Emerald Empire, to bolster their defenses against the unknown? When the vote was tallied, it was agreed upon that the Unicorn would send a shugenja to the Imperial City of Otosan Uchi to teach Meishōdō to the Seppun Family. Now, the time has come for Iuchi Shahai, daughter of Iuchi Daiyu, to abandon her home and make for the Imperial City. Torn between her duty to the Emperor and duty to her clan, Shahai instructs Seppun shugenja in the art of Meishōdō while searching for a way out of this prison of honor. Fantasy Flight Games is proud to present “Heart of the Garden” by Edward Bolme, a new story set in the world of Legend of the Five Rings! 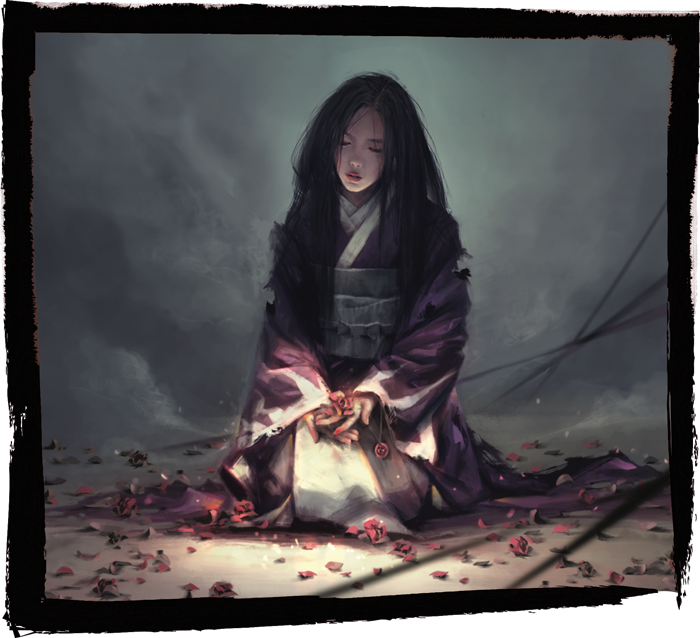 "Heart of the Garden" focuses on the Unicorn Clan and follows up on plot points found in “Smokeless Fire” and “A Most Suitable Teacher.” Spinning out of the decision from the Kiku Matsuri of Gen Con 2017, the story can be downloaded here (1.5 MB). Check the Fantasy Flight Games website every week for more information on Legend of the Five Rings: The Card Game and Legend of the Five Rings Roleplaying! Next Wednesday, look for another short story by Marie Brennan focusing on the Dragon Clan! Find the balance of the elements with The Ebb and Flow (L5C12) for Legend of the Five Rings: The Card Game, available now from your local retailer or our website!